The Chakras are explained as “spinning wheels of energy”. 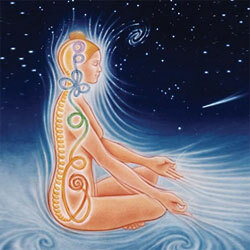 There are seven major chakras that interact with our body and influence our thoughts, moods, and health. In the Kundalini Yoga tradition, Yogi Bhajan said we have an eighth chakra that encompasses the entire body, combining the effects and improves the workings of all the other chakras. Each chakra has an important function and we need all of them, no chakra is more important than the other. Through Kundalini Yoga, Yogi Bhajan has shared many techniques for us to work with this system and move toward higher states of consciousness. Yogi Bhajan teaches us how the chakras represent various parts of the physical body, our emotions, our perceptions and how we project ourselves out to the world. Please join Karan Kaur and myself for a workshop to help you understand how the chakras operate and to discover the particular talents, gift or skill we can gain to enhance our lives. No yoga experience is necessary. Before coming I felt tired and a bit foggy. After the workshop I feel alive, refreshed, open, and loving. I enjoyed the final meditation and the intention setting. I will continue to recommend the workshops.